IPSR has state-of-art instruments and facilities for plant research and it specializes in plant responses and adaptation to variable stress conditions, utilizing broad variety of plant genetic resources developed in the institute. IPM envisions CATSEM operating as a comprehensive analytical system continually evolving toward greater accuracy and higher spatial resolution. Data produced via this system will provide important information regarding the origin and evolution of planetary bodies such as the Earth, Moon, Mars, and asteroids. For more detailed information about other facilities at IPM, please click here. 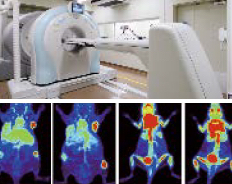 OMIC has fully equipped molecular imaging research facilities such as Cyclotron and PET (C-11, N-13, O-15, F-18, Cu-64, and Zr-89), was established at Okayama University (hospital site) as a collaborative research center for industry-academia-government teams in 2009 by the Japanese Science and Technology Agency (JST). More information about OMIC, please click here. The Center is comprised of four departments: Radiation Research, Animal Resources, Genomics & Proteomics, and Instrumental Analysis & Cryogenics carrying out integrated operations and management and multifaceted education research support services based on a long-term perspective that moves beyond areas of research. In particular, radioisotope experiments, animal experiments, and recombinant DNA experiments required in the research of advanced science fields demand a high degree of compliance.